Last Tuesday, July 2, the Undocumented Caravan for the Trust Act arrived in Sacramento just in time to testify at the public safety committee hearing in support of the bill (AB4). We were certain that it would pass its way through much like last year, with no opponents except for the California Sheriffs' Association, which seems to be run by a bunch of wannabe Sheriff Joe Arpaios. What we weren't certain of was whether Governor Brown would keep his promise to support the bill and sign it "forthwith." Since the TRUST Act was originally introduced, Governor Brown has ignored community organizations and people actually affected by whether the TRUST Act passes or not. Instead, he has lent his ear to Immigration Customs Enforcement (ICE) and the Sheriffs' Association who have defended criminalizing the immigrant community and keeping deportations high in California. We have heard nothing but lies about the Secure Communities deportation quota program since it started in California. First, it was DHS, which sold the program as counterterrorism measure. Then sheriffs willfully ignored Attorney General Kamala Harris's memo outlining their legal discretion. Now we're at a point where we know one thing to be true: With nearly 100,000 Secure Communities program deportations since 2008, the immigrant community can no longer afford to compromise. We decided to take a 600-mile-long caravan from Escondido to Sacramento to expose the truth about police and ICE collaborations in local communities and to bring stories of people in deportation proceedings to Governor Brown. The very people most affected by the unjust status quo and ignored by Brown, undocumented Californians and people in deportation proceedings, set out to let the governor know that we can no longer wait. We need the TRUST ACT signed into law now. Brown pledged to sign the bill this year, and we went to Sacramento to remind him of the urgent need to act on his promise. We know he has met with sheriffs. We know he has met with ICE. But he hasn't heard from the community, which helped propel him into office. 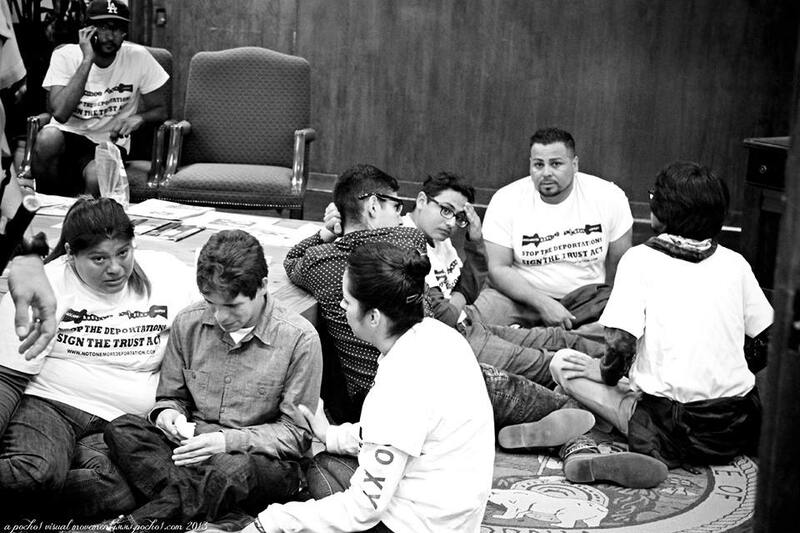 So we walked peacefully into the governor's office and refused to leave until we have a meeting with the governor knowing that we could be arrested and that arrests for undocumented people such as ourselves could lead to our deportation because of the absence of the TRUST Act as a state law. While sitting in, we were lectured about going through traditional means of securing a meeting instead of remaining there. We knew attempts in the past were futile so we stayed. Some who didn't blink when Sheriff Baca, who vowed to outright and illegally defy the TRUST Act if it were passed, found reason to condescendingly criticize our "belligerence." They tried to convince us to leave but as tough as those on duty that day appeared to be, we knew they were more scared than we were. If we were arrested, many of us with criminal records would be flagged by the Secure Communities deportation program, and we might receive an ICE hold and be sent to immigration detention. We would rather risk deportation ourselves than let the deportations of our communities in California continue. What could happen to us, if arrested, is what happens everyday without the TRUST Act in California. But by undocumented people coming out and making our arrests public, the story changes. They did not arrest us. Instead we were cited and released, which we can't help but question, what makes us special? If the governor's office didn't want to see us arrested and targeted by S-Comm, then why not the rest of the undocumented population in California? We'll have our opportunity to discuss that this Wednesday when we have what we sat-in to accomplish, a meeting with Governor Brown so that his office can hear from the deportees and not just the deporters. When that happens, we expect him to follow-through on his promise to support the Trust Act "forthwith."